Declan Farmer (Tampa, Fla.) tallied a goal and an assist and Kyle Zych (South Hadley, Mass.) scored his first goal in his national team debut as the 2018-19 U.S. National Sled Hockey Team blanked Canada, 3-0, in its opening game of the 2018 Para Hockey Cup. "That was a complete team effort and a great way to start the tournament," said David Hoff (Bottineau, N.D.), head coach of the 2018-19 U.S. National Sled Hockey Team. "We weren't perfect by any means, but we did a lot of things well and know where we can improve. We'll enjoy this tonight and look towards facing Korea tomorrow." The U.S. (1-0-0-0/W-OTW-OTL-L) returns to action tomorrow when it faces South Korea. Puck drop is set for 7 p.m. ET at Western Fair Sports Centre and will be streamed live on HockeyTV.com. In a rematch of the gold-medal game of the 2018 Paralympic Winter Games, both teams opened the game with quality scoring opportunities. After the U.S. saw early chances from Farmer and Brody Roybal (Northlake, Ill.) go wide, U.S. netminder Steve Cash (Overland, Mo.) made a point-blank save on Canada’s Billy Bridges midway through the frame to keep the game scoreless. With 2:45 to play in the period, Farmer opened the scoring with a powerplay goal off a pass from Roybal. The play started when Roybal collected the puck and curled around the top of the right circle. After drawing two Canadian defenders towards him, Roybal slid the puck into the slot where Farmer received it and fired a right-handed shot over the glove of Corbin Watson and into the top-right corner. The U.S. gained control of the game in the middle stanza, scoring twice and nearly tallying on two other opportunities as it pushed its lead to 3-0. Rico Roman (Portland, Ore.) doubled the lead 4:05 into the stanza when he put home a pass from Farmer. The goal came when Farmer was able to grab the puck in the right corner, skate behind the net and find Roman alone above the crease for an easy 2-0 lead. It appeared Team USA would score again less than two minutes later when Roybal found Josh Sweeney (Portland, Ore.) alone in the slot but his shot was denied by Watson. With 4:39 to play in the stanza, Zych scored his first goal with Team USA whenJack Wallace (Franklin Lakes, N.J.) sprung him on a breakaway opportunity that he tucked past Watson. Another U.S. powerplay late in the period saw a pair of chances from Roybal sail just wide as Team USA entered the second intermission with a 3-0 lead. Neither team converted in the final stanza as Cash finished with nine saves to secure the shutout. NOTES: Kyle Zych (South Hadley, Mass.) was named the U.S. Player of the Game ... 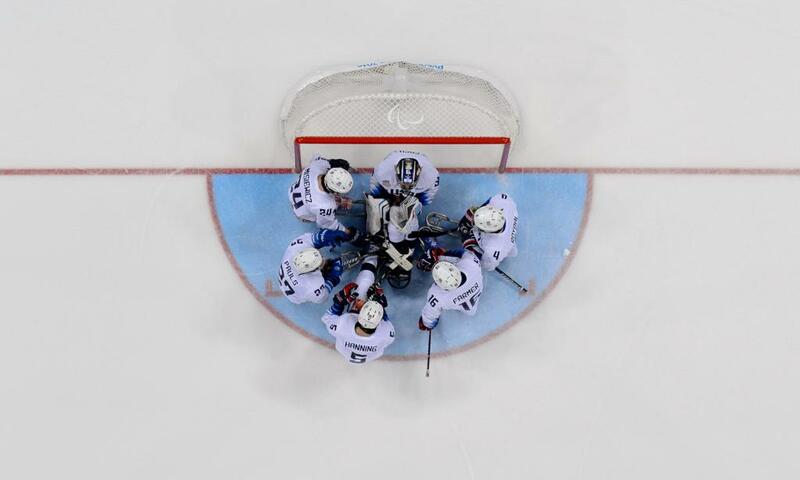 The U.S. outshot Canada, 23-9, and finished 1-for-3 on the powerplay and 2-for-2 on the penalty kill ... For complete game statistics, click here ... Deloitte, Labatt USA and Toyota are proud sponsors of the U.S. National Sled Hockey Team ... For complete coverage of the U.S. National Sled Hockey Team, click here.